AC Skin Care Solutions Ltd. was established in 1999 and is a sister company of Hi-2 Cosmetics Ltd (estbl. 1974). 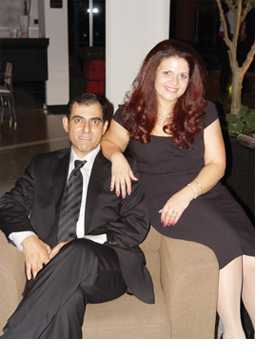 The general managers and owners of the company are Andreas & Xanthi Charitonos. AC Skin Care Solutions Ltd operates primarily in the professional beauty market serving aestheticians, beauty institutes, and spas in Cyprus and Greece.More specifically, it focuses on the distribution of professional nad retail cosmetics lines, including professional nails & make-up, salon therapies, beauty salon equipment and machinery and salon furniture. AC Skin Care Solutions Ltd. currently serves over 400 aestheticians, beauty institutes and spas, in Cyprus. Prior to assuming managerial control of AC Skin Care Solutions Ltd and Hi-2 Cosmetics Ltd in Cyprus, he had managerial responsibilities in the area of product marketing in large private organizations in the United States. As part of his duties he travelled regularly and extensively in south America and Korea where he would deliver presentations aiming in the marketing of services. He was invited and took part twice in German business delegations to Kazakhstan to deliver marketing presentations. He was one of the founding partners in ARTCO an internet marketing company based in California, which was one of the first companies in the United States to offer internet marketing and web design technologies. Mr. Charitonos is an active member of the American Marketing Association with Professional Member standing. Our cabin products cover all the needs of the professional beauty institute. We offer a wide selection of cleansers, creams, masks, peelings, serums and ampoules, as well as unique products such a the only natural thalasso treatments. All cabin products offer associate retail lines for home use, enabling the beauty professional to suggest and sell them to the client in order to continue their treatment at home for better results. We offer exceptional,effective treatments to cover the needs of even the most demanding beauty professional. We currently offer over 70 cost-effective treatments to choose from. We also offer a wide variety of salon disposable products, wax epilation, and selective salon equipment and furniture. We organize 3-4 professional seminars each year, where new treatments are presented. For information on our seminars and dates, please inquire by email or give us a call at 22756570 or 22754005. .